Yes folks! Its that time of year again! After a jam packed 2011 myself and More Brains, Vicar? have just started organising the second Kustom Kristmas event! For more info head to our facebook event here! Or check out the flier below, designed by myself and MBV! I’ve recently added some new Clumsy products to my small range! These Clumsy Compact mirrors are only £3.50, with free postage (UK only please inquire for Int. shipping). They make the perfect gift for Valentines day! Contact me to purchase. Kustom Kristmas is nearly here! I’ve been pretty slack at updating the blog recently and part of the reason for that is I have been organising an amazing event in Holloway. London. Kustom Kristmas is going to be spectacular! 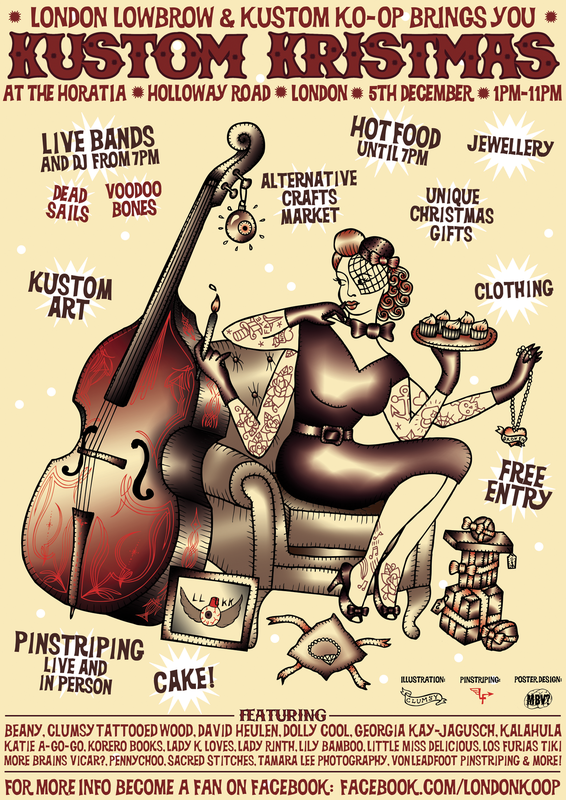 Taking place on the 5th December from 1pm til 11 pm, Kustom Kristmas features the cream of London’s alternative crafters, makers and artists. Come and celebrate Christmas in style at Kustom Kristmas, have Sunday lunch, and peruse the stalls featuring one of a kind Christmas gifts, jewellery, home wares, clothing and greetings cards. Our Art Korner features emerging Kustom, Lowbrow, Tattoo and Tiki artists, and Live painting and Pinstriping. Entry is free, and there will be live bands Voodoo Bones and Dead Sails, plus DJs playing Rockabilly, Rock N Roll and Punkabilly til closing time. The Horatia is conveniently located 5 minutes walk from Holloway and Highbury & Islington Tube stations. Come down on the day and get all your Christmas presents sorted! I’ll be hanging out in the Art Korner so come say “Hi” and buy some Clumsy goodies! The poster illustration was a collaboration between myself and Von Leadfoot Pinstriping, and the Poster design was done by my Kustom Kristmas co-organisor, More Brains, Vicar? Head to the facebook events page here! I have been busy recently working on something pretty exciting for Kustom and Lowbrow art fans in London. Myself and a couple of like mided souls are getting together to form a group called London Lowbrow & Kustom Ko-op. The intention is to put on exhibitions and events in London. 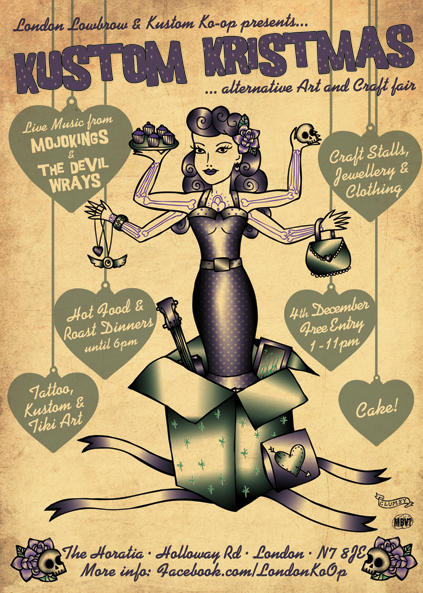 The first event will be Kustom kristmas, at The Horatia on Holloway Road. Taking place on the 5th December from 1pm til late, Kustom Kristmas will feature the cream of London’s Kustom crafters, makers and artists. It’s the ideal opportunity to pick up one of a kind Christmas gifts, with alternative craft stalls, clothing, live art and pinstriping, a great food menu, and live bands in the evening. Entry is FREE and The Horatia is conveniently located 5 minutes walk from Holloway and Highbury & Islington Tube stations. There will be more details about the group coming soon. In the meantime, head over to www.facebook.com/LondonKoOp to find out more and join the group. Or message me if you are not on Facebook and I can send you more details. We are looking for London based artists, kustomisers and alternative crafters, who would be interesting on selling at the event. I’ve had a couple of weeks off after a hectic May and June of art funtimes. Work has been pretty busy getting the Criminal Damage Autumn/Winter 10/11 collections together. It’s looking good! Anyway, in the last week or so I have made some more arty plans for the summer. The Art With a Pulse II show is still on at 20-21 Visual Art Center in Scunthorpe. You have untill the 3rd September to go and check it out. In August I will be exhibiting at what is fast becoming the UK’s premier Tiki event, Puttiki, in Hastings. This is shaping up to be a very exciting weekend, with a Tiki Art show, Crazy Golf, and the UK premier of the film Tikimentary. And ofcourse lots of drinking! I have recently started on a collaboration between Los Furias Tiki and myself. I’m not going to give too much away but it will make its debut on Pirate Day in August. And it might feature monkeys, of a sock variety. Hopefully this will be the first of many monkey related collaborations. Also in August, I will be exhibiting one or two pieces at Tattoo Jam, in Doncaster, dabbling in a spot of live art, and franticly preparing for Kustom Kulture Blastoff, in September. Tiki Today/Art With A Pulse Pics! Here are some piccies from the Tattoo Luau event at the weekend. The whole event was loads of fun, and a big thanks goes out the Shell Lally from 20-21 Visual Arts Center for all her hard work. The mural painting was a great success with a collaboration between myself, Los Furias Tiki, and Kristian McLean. We had never worked together before, but I think it was one of my most successfull collaborations to date. The finished results can be seen, along with the Art With A Pulse show, untill August, at 20-21 Visual Arts Center in Scunthorpe. I´m still alive and kicking! Kustom Kristmas- A Great Success! Clumsy’s Blog · Design, Art, Illustration and Adventures of a Clumsy Nature!